Long ago, before the likes of Persona and Etrian Odyssey had even been thought of, Atlus was a very different company. This was a decidedly younger Atlus, perhaps one that had yet to find its feet as the RPG powerhouse we know today. This is an Atlus that brought you tie-ins of a questionable quality, such as Friday the 13th and The Karate Kid on NES. This is also an Atlus that came up with the name ‘New York Nyankies’, and that’s a truly wonderful thing. Picture this: a young, up-and-coming ‘jazz cat’ trying to make his way on the rough, tough streets of the Big Apple… but not as you know them. 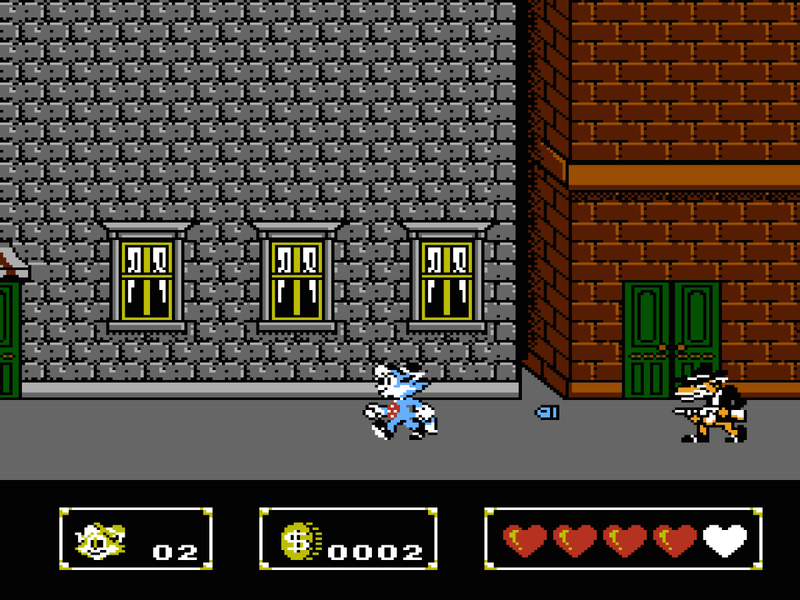 Dogs have overrun the city and are proceeding to spread the tyranny of their organised crime through the streets; vandalism, littering, openly carrying firearms in broad daylight, and not to mention the most heinous crime of all, kidnapping the girlfriend of our titular ‘Nyanky’. I say ‘Nyanky’, but in the west this game lost this illustrious title, instead going under the more safe guise of Rockin’ Kats, our protagonist now called ‘Willy’. 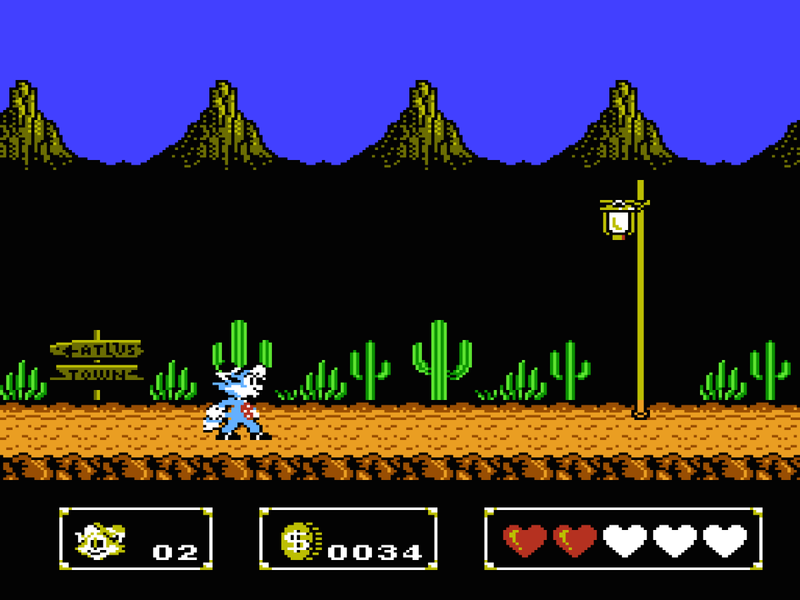 It has to be said that the game certainly has an original concept behind its themes, which stands in quite stark contrast from the more ‘hip’ and modern titles Atlus produce today; N.Y. Nyankies feels like it could easily be a tie-in for a saturday morning cartoon, or even an anime adaptation à la Samurai Pizza Cats. 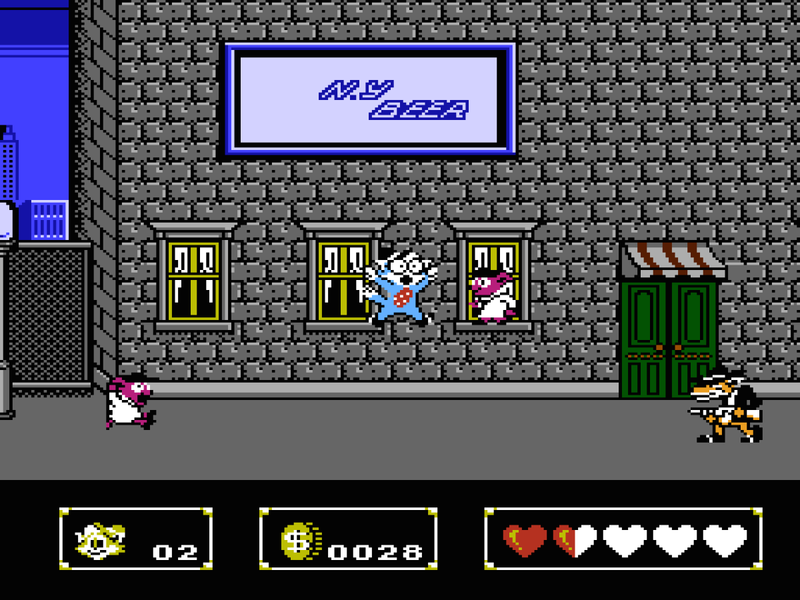 It’s no surprise that this particular title made its way to the arcades via Nintendo’s PlayChoice-10, an arcade machine capable of running up to 10 NES titles; it’s got just the right difficult level to be an arcade title, hard enough to rob most unsuspecting youths of their quarters, but a rewarding title for those who can master the game’s ‘Punch Gun’ mechanic; Willy’s (I’m going to go with the US name, because eventually you’ll all get tired of me writing ‘Nyanky’ over and over again) weapon of choice is essentially a revolver that fires out a giant white fist that can be used to bash enemies heads in, pick up certain objects, bounce around like Scrooge McDuck and even swing from buildings in a manner that I can only describe as being like an even more physics-defying, less Nazi-resurrecting Bionic Commando. 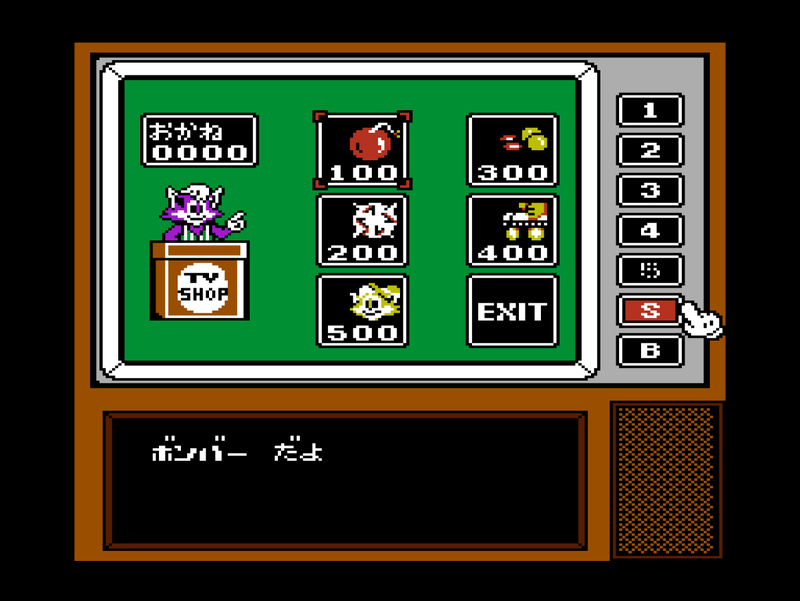 Luckily, this isn’t the game’s sole weapon; various upgrades can be purchased through a store inside Willy’s TV (something which also serves as the game’s stage select; clearly this was the inspiration for Persona’s TV World, right?) such as bombs, extra lives and even roller skates to increase your speed. You can’t buy any of these until you earn enough money, however, and this will require enough skill to beat one of the four levels open from the start of the game; clearly this game has a learning curve and requires some investment if you want to get the most out of it. 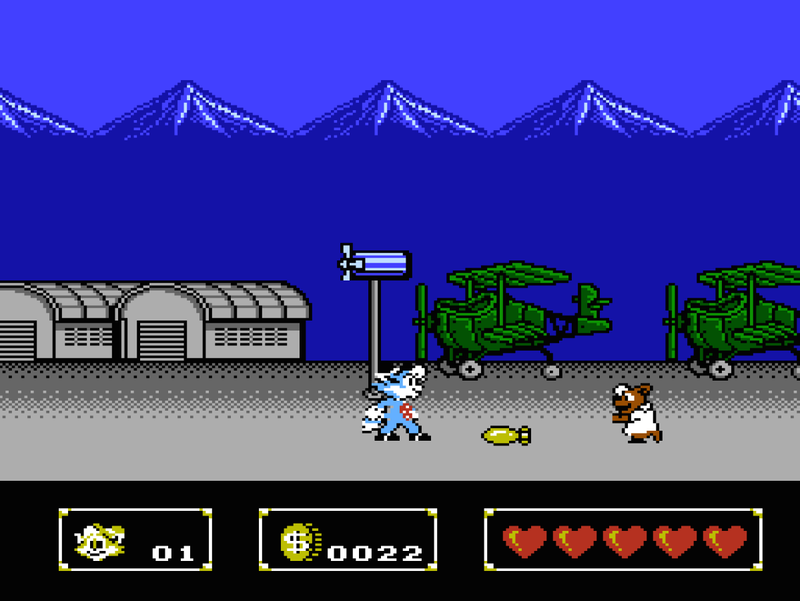 There’s a nice yet surprising variety of stages from a game with New York in the title; the opening level sees you on the city streets, but the game’s second stage closer resembles something out of Operation Wolf, albeit with an absence of wolves and instead featuring bears throwing some kind of napalm bombs. Stage three is set in some kind of terrifying circus world, complete with bratty dog children tearing around on scooters and… evil pandas throwing spinning plates? It seems like every species you could imagine is out to get our feline protagonist, so you’ll certainly have to have your whits about you… and be good at using that giant fist gun. The fourth stage takes you to the Wild West, which is quite the departure from New York City. I feel like at some point in development Nyankies became more of a ‘Stereotype of the US World Tour’ game as opposed to one focused around the Big Apple, but hey, it beats playing the same stage again and again and helps to keep things fresh. 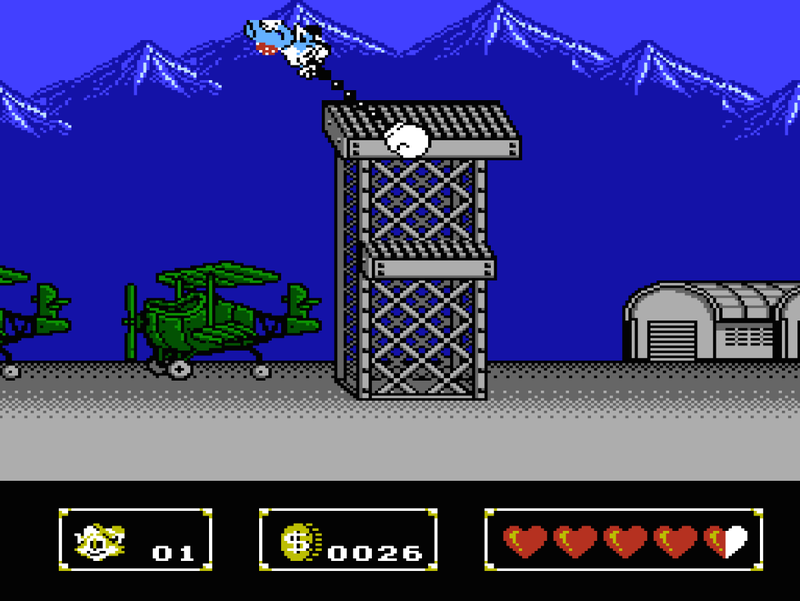 The fact that you can tackle any stage in any order you want is a nice, Mega Man-esque touch too. Keep your eyes peeled for the various bits of Atlus imagery, such as that sign pictured above; tiny self-inserts are dotted all around the game! N.Y. Nyankies is simple enough that it’s accessible as a quick platforming romp, but has a good enough learning curve in there that it rewards those willing to master it’s quirky but inventive toolset. I think it would be nice to see Atlus throw their modern day conventions out of the window for once and try their hand at a game like this again; I’m sure they’re more than capable of pulling it off! This entry was posted in Features, You've Probably Never Played... and tagged Atlus, Famicom, Features, NES, Nintendo, You've Probably Never Played.... Bookmark the permalink.